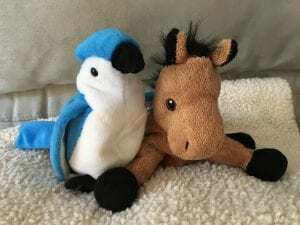 I called the horse Blue and the bird Whinny. What grand adventures they had – one had the gift of roaming the ground, one the advantage of the sky. A tale of perspective. A tale of friendship. A tale of triumph and consideration and cooperation with gifts. The next day, our four year old found these two. Instead of delight, she was chagrined that they had an adventure without her. So, she separated them. Banishment to separate lands is another story, another lesson. The motive behind the banishment is yet one more facet of the tale. 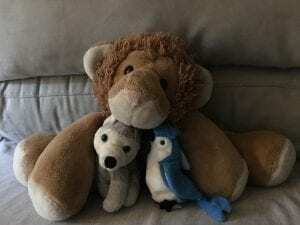 The Lion, The Wolf, and The Bluejay. Choose one of the above pictures and write a child-like tale. Read a few of Aesop’s Fables if you need some help. Or, visit the children’s section of the library. Your story can be no more than 800 words. Write a devotional about unlikely friends, or the value of steadfastness. Read the backstory of David and Jonathan in the following passages to give you insight into the sweet bond of godly friendship. Consider an empty-nester. Usually, we think of women and their emotions after the children have gone, but I want you to put yourselves in the shoes of the father whose children have all grown up and moved away. Write whatever comes to your mind however you must include the grouping of beloved stuffed animals and the piece must be written from the father’s point of view. Have fun with these prompts and feel free to comment below!